$500 SYNDICATE STRONGEST PULL BONUS! Who will crank the hardest turn and load up the rope with the most pounds of tension to win the $500 bonus and bragging rights? 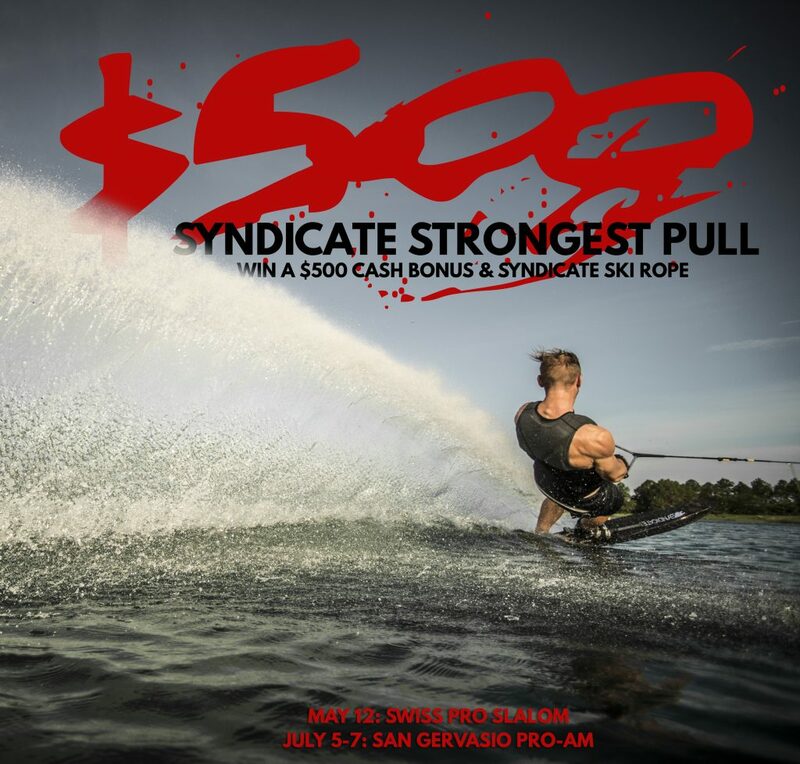 We’re excited to announce a $500 bonus for the skier who can pull the hardest at the Swiss Pro Slalom on May 12th and San Gervasio Pro Am on June 5-7th. Our Syndicate Knotless mainline, the exclusive rope of the events, will be hooked to a tension gauge in the preliminary rounds. The guy or girl who puts the most tension on the rope at any point in the course of the prelims will walk away with a cool $500 bucks and bragging rights as the skier with the Strongest Pull! Stay tuned on our instagram and facebook for more info! Each of these pro events will be pulled exclusively on our Syndicate Knotless Mainline rope, guaranteed accurate and able to withstand the hardest pull without losing its precision. 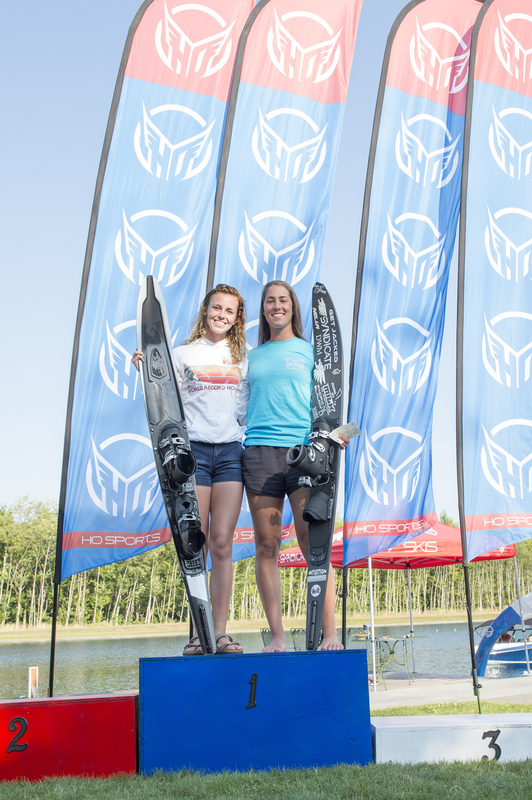 The Syndicate Knotless mainline is also the exclusive rope sponsor of the Travers Grand Prix, held at Jack Travers’ Sunset Lakes on May 3-4th 2019, and the HO Skis NCWSA Collegiate National Championships October 10th-12th, 2019. The Syndicate Knotless Mainline is just that, knotless. This means you’ll never have to smack your rope on the side of your boat to get to that line length that seems now inaccessible due to rope knot lock-up. The knotless mainline seamlessly connects on each look with itself, no knot needed. This also increases rope life, so you can enjoy one rope for much longer. Our spiral weave construction eliminates rope twist and reduces water retention. 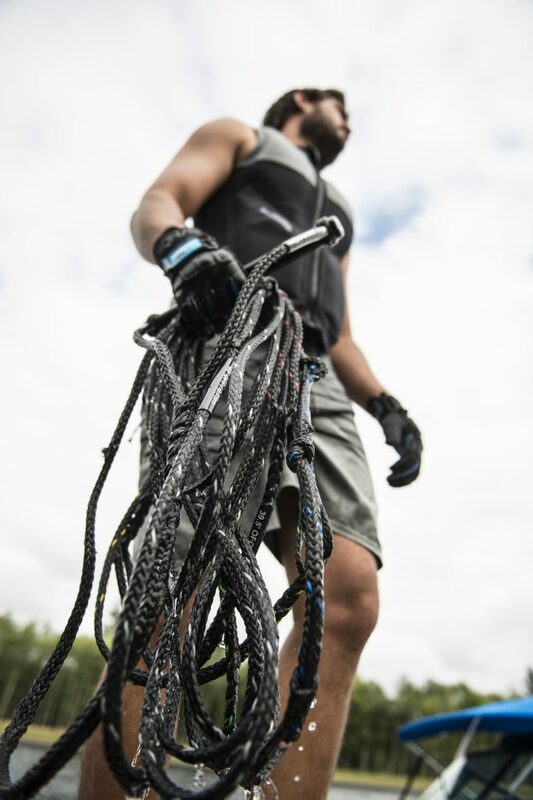 This means a lighter, less waterlogged rope that gives you the all the length you deserve each pass. The Syndicate Knotless Mainline is also GUARANTEED ACCURATE! Every section of every line is double-checked for accuracy in our Snoqualmie offices in the USA. 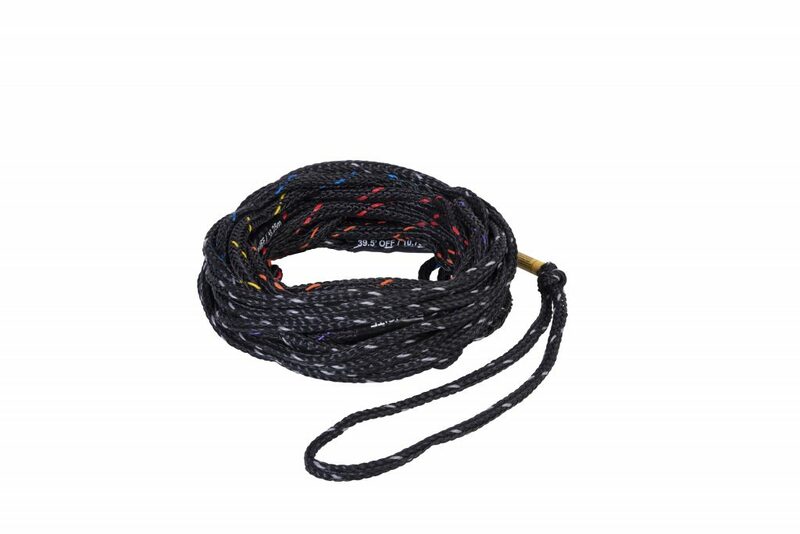 This 80-strand pre-stretched rope is guaranteed to accurate length requirements or your money back! Lastly, it’s got a new oversized handle loop, for easy connection with all handle types and ID sleeved that indicate length from 15’off to 43’off. Chris Parrish, Welcome to The Syndicate! Parrish locks up his new Syndicate at Jack Travers’ Sunset Lakes, just before 2019 Shreducation. 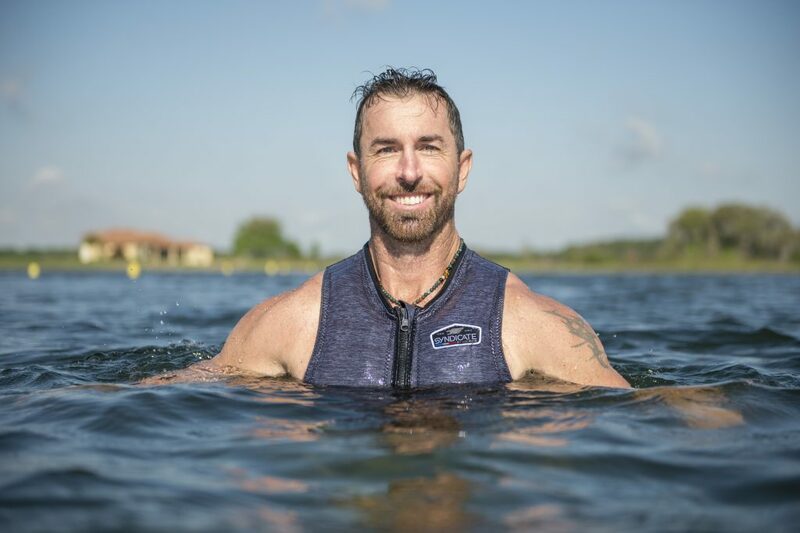 If you’re a waterskier and someway/somehow don’t know Mr. Parrish, here’s a handful of his career pro slalom highlights: 3x World Record Holder, 5x Moomba Masters Champion, 2x US Open Champion, 2x US Masters Champion. From the ripe age 15, Parrish was a competitive force on the pro tour. In 2005, he became a THE premiere skier in the world, winning the US Masters, US Open, Malibu Open, Diablo ProAM, Orlando BS Pro, Kaiafas Cup en route to claiming the #1 World Ranking spot from his friend and hero Andy Mapple. From 2006 through 2013, CP remained in the top 10, reaching #1 again in 2009. What does the future hold for CP? What explains the CP/HO pairing? Chris joins an absolutely stacked ski team featuring active pro skiers Will Asher, Jon Travers, Nick Adams, Benjamin Stadlbaur, Matteo Luzzeri, Jaimee Bull, Zane & Allie Nicholson, Rob Hazelwood, Geena Krueger and many more. 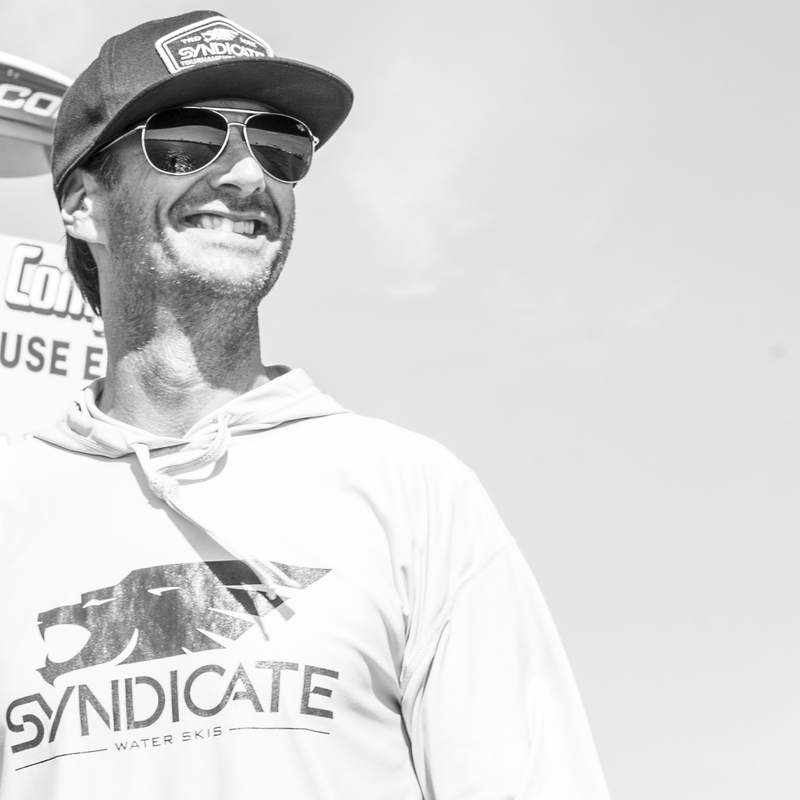 [click here for the full Syndicate team] CP’s knowledge and experience with ski design fits perfectly with the Syndicate Pro team as well as it’s legends & designers like Bob Lapoint, Wade Cox, Jack Travers, Marcus Brown & Dave Wingerter. 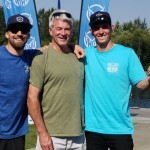 This past weekend, Syndicate Skier Rob Hazelwood tied the long standing British U21 Mens Slalom record with a score of 3 buoys at 41’off / 36mph (10.25 meters / 58k). Rob Hazelwood has the ski fire in his blood. Born & raised in England, Rob is the latest edition of the Asher/Hazelwood ski dynasty, that produced to Syndicate Pro Will Asher, Tom Asher, ski legend Mike Hazelwood and many more super skiers. First on the water at the ripe age of 2, Rob has taken advantage of every opportunity for ski sets he can get. 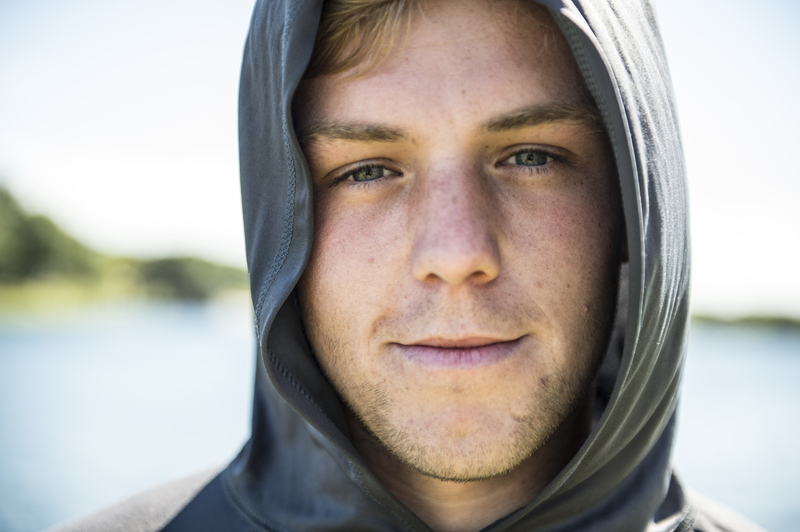 Famous for his quick succession by becoming the U12 and U17 British slalom record holder, 2016 Junior World Slalom Champion, taking 2nd at 2015 junior Masters, winning u21 at Rob is infamous around his home lake for hogging water-time. Stepping into the pro scene, Rob is already running into 41’off/36mph and jumping well over 200ft. Judging based on his intrinsic drive and talent, it’s not a question of IF Rob becomes a dominant force in Pros, but WHEN. Unfortunately a day or two after his record, Rob crashed while turning 3@41’off in practice suffering a serious forearm injury, requiring surgery. We wish Rob luck in his recovery. As driven as he is, we have no doubt he’ll be charging back up the ranks before long. 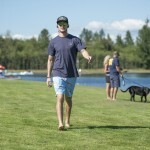 The 2018 Syndicate Hilltop Pro-Am kicked off bright and early Saturday at magnificent Hilltop Lake in Arlington, Washington. With the sun out, temperature mild and water bluer than you can imagine, dozens of skiers pushed themselves to test their limits in search of that elusive personal best. 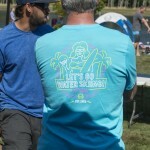 Pro skiers in attendance included last year’s Pro-Mens Champion Nick Adams, two-time winner Will Asher, Jon Travers, Terry Winter, Benjamin Stadlbaur, Zane Nicholson, Dave Wingerter, last year’s Pro Womens Champion Jaimee Bull and Allie Nicholson. 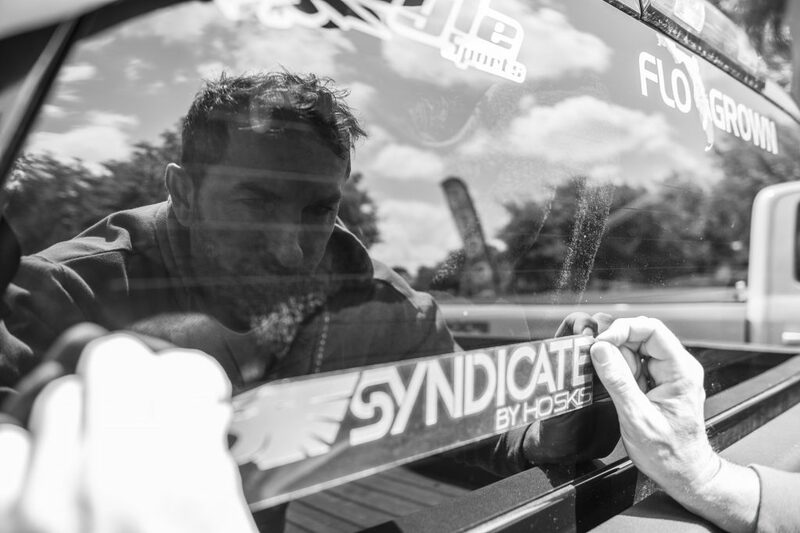 Eyes were on Asher, Travers & Stadlbaur as they gave onlookers a sneak peek at the upcoming 2019 Syndicate Alpha ski. 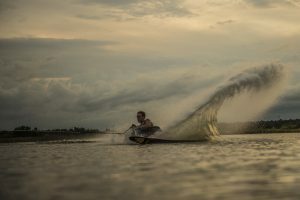 With a successful summer on the developmental versions that included Pro-Am wins and podium finishes, the new production Alpha ski was ready for primetime. The Pro format was set as a best score of 3 rounds wins, with the top 4 pro men and top 2 pro women facing off in a Head-to-Head bonus round. Hot out of the gate, Will Asher put up a 3@41’off top score, with a backup score of 3@41’off in the second round. Jon Travers wasn’t far behind, putting up a 3@41’off of his own, backed up by a 2@41’off. Coming in 3rd place in the prelims was 2017 H2H champ Nick Adams with 2@41 and a 4@39’off backup, followed by Terry Winter with a 2@41’off and 4@39 backup. Just edged out of the finals was Beny Stadlbaur who managed 1.5@41’off after a sick 39’off pass. Zane Nicholson started off strong with 5@39’off while Dave Wingerter rounded off the pro mens field with 2@39’off. Also impressive in the amateur divisions were Travis Feldhanger’s big scores, running 38’off all 4 sets, finishing with 3@39. Dave Miller put up a big score of 2.5@41’off/34mph in the MM division. On the Womens side, Jaimee Bull claimed victory with a top score of 3@39’off, while Allie Nicholson tied her personal best with 2@39’off. #1 Will Asher vs. #4 Terry Winter: Asher elected to go first, running 39’off while Terry Winter looked solid but skied just inside of 6@39, capping off the first matchup with 5@39, sending Asher to the final. #2 Jon vs. #3 Nick Adams: Travers elected to start, running 2@41’off putting the pressure on Adams to beat his score to stay alive. Adams, also smashing through 39, matched JT’s score of 2@41’off, advancing Travers to the finals. In a battle of the new Syndicate Alphas, Asher rode the freshly pressed stock Alpha while Travers stuck with his final shape developmental Alpha. Travers Alpha ski, had led him to the Lake 38 Pro-Am victory(just edging out Asher), and showed it’s sturdiness by bringing him midway through 41 after being run over by a golfcart. Unfortunately in the finals, though, Travers slipped up at 39’off, leaving Asher with a smooth route to victory. After electing a boat/driver combo, Bull surrendered the order selection to Nicholson who then chose to start. Fighting her way through 38’off, Nicholson stunned onlookers by running 2@39’off, matching her personal best in the h2h final. Needing the get a piece of 3 ball at 39, Bull ran a solid 38 but took a little too much angle out of 2@39, popping the handle and securing victory for Nicholson. Congratulations to all skiers who competed in this year’s event. It’s always a treat to see some of the best skiers in the world going toe-to-toe one of the best sites in the world. 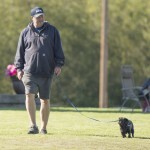 Big Thanks to Gordon Skoog and the Hilltop Lake Club for hosting, all of the judges and volunteers for their hard work and Todd Aalbu/Pro-Action Physical Therapy for the continued support. 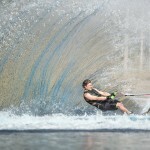 Ski with Waterski Legend and Hall-of-famer Wade Cox! Wade Cox coaching tour dates announced! Wade Cox has announced his 2018 Ski with Wade Tour, kicking off May 14th. 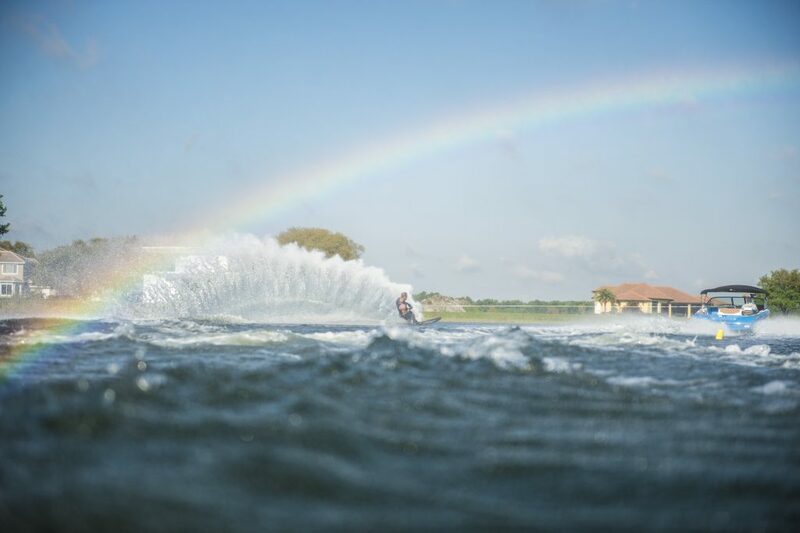 This is your chance to ski with one of the winningest waterski pros of all-time with 47 pro victories. Sign up for a spot in his traveling coaching tour and get one-on-one instruction from the three time US Masters Champion turned well respected coach. 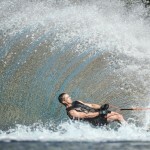 Wade brings his decades of skiing and coaching experience with a unique perspective to a lake near you. 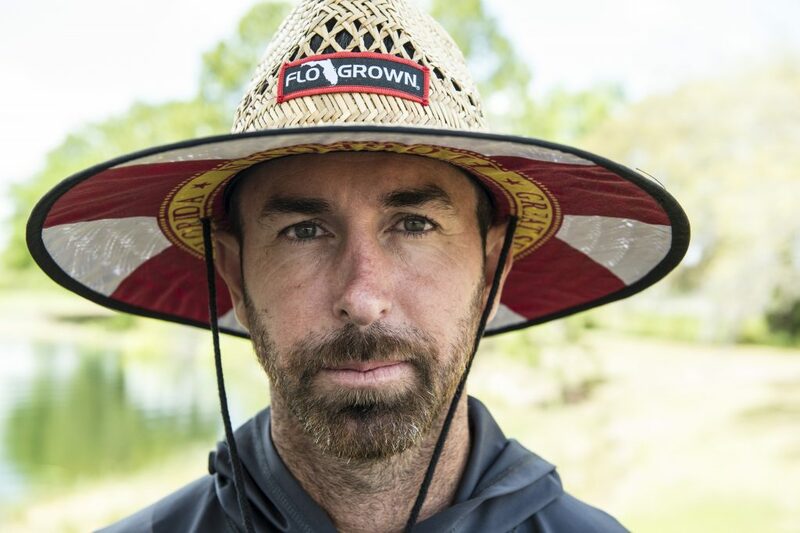 A long time HO Skis posterboy, Wade will help you get your gear dialed, provide tips to get you to the next level and tell stories from his tour years that you’ll never forget. Space is limited, sign up now. (instructions after tour dates list below). 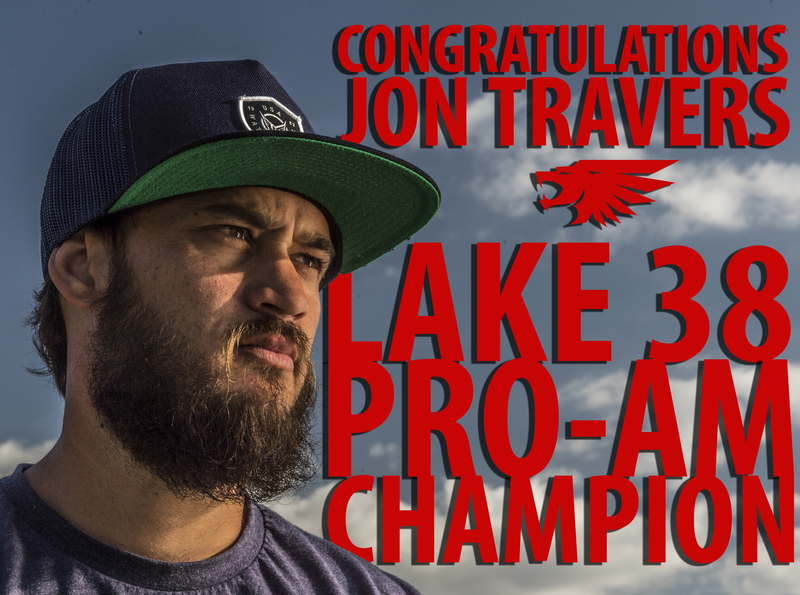 Jon Travers wins Lake 38 Pro-Am after running 4@41 in the rain! 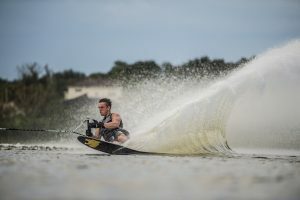 The first annual Lake 38 Pro-Am, held outside of Talahassee, FL on June 9 -10th was the stage for an epic slalom battle between two top Syndicate pro skiers: Jon Travers & Will Asher. Coming into the finals,Travers had two rounds of 2@41’off/36mph under his belt in Saturday’s preliminary rounds. 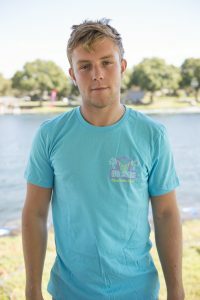 His scores propelled him in joining fellow Syndicate teammates Beny Stadlbaur & Will Asher who along with 3 other skiers ran 3@41’off going into the 8-man final round on Sunday. Unlucky for Jon, the early finals seeds faced heavy rain that tapered off as the finals drew out. Undeterred by the rain, JT doused a pair of wood-working goggles, strapped on his Syndicate ski and put out a massive 4@41’off, the top score of the weekend. As the finals drew on, Travers remained atop the leader-board as skier after skier failed to match his huge score. That was until fellow Syndicate teammate Will Asher stepped to the course. 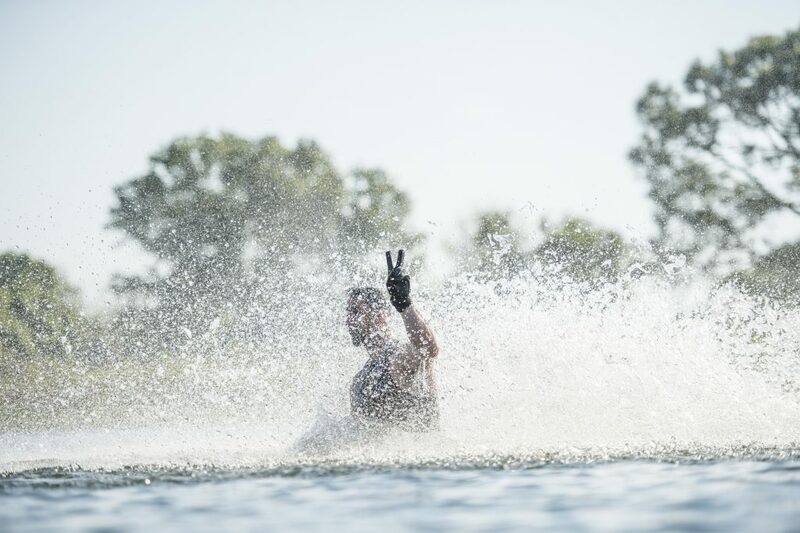 Blazing his own 4@41’off, Asher tied JT for the lead, forcing a run-off for the Lake 38 Pro-Am title. After suiting back up and losing the coin-flip, Travers wowed onlookers by running a cold 39.5′ off the dock. Having not skied in over 45 minutes(5 skiers), running his 39 off pass with no warm ups stood as a tall task for Jon. However, skiing just inside of 4@41’off, ending with a runoff score of 3@10.25m,Travers showed no sign of rust. Asher, running his cold 39.5′ couldn’t quite match Travers 41’off score, conceding victory to his Syndicate teammate. Syndicate Hilltop Pro-Am Dates Announced! The Syndicate Hilltop Pro-Am, a 2-day 4-round record slalom tournament capped off with a Head-to-Head Pro final will celebrate it’s 3rd year on August 4th and 5th, 2018. 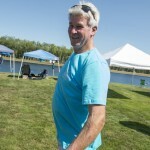 Held at the immaculate Hilltop Lake in Arlington, Washington, the event offers pro skiers a shot at a $10,000 prize purse at a venue capable of producing world record scores. 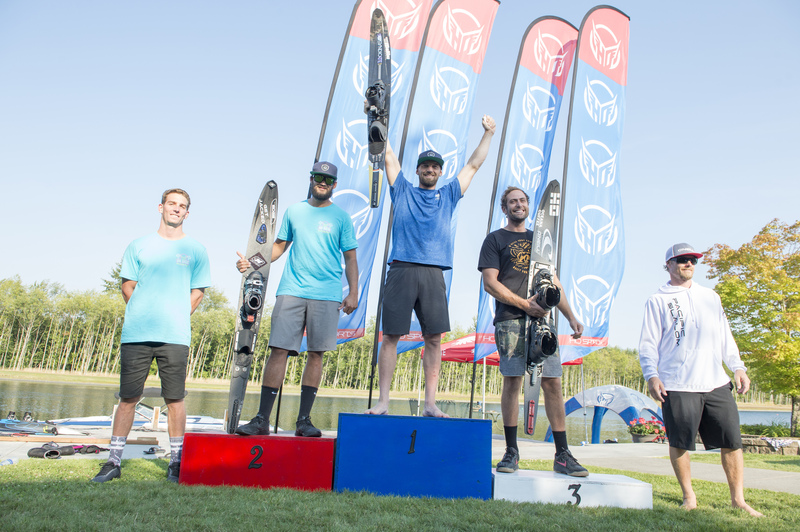 In the record rounds, amateurs share the dock with pros, skiing for personal bests and HO gear at the heavily tree protected blue waters of Hilltop. Last year, Nick Adams took home the crown after hard fought head-to-head matchups, defeating the likes of both Jon Travers and Will Asher, while Jaimee Bull took home the pro womens victory. Pros can enter by contacting Shannon Strickland at hilltopproam@gmail.com. All Pros welcome to compete. 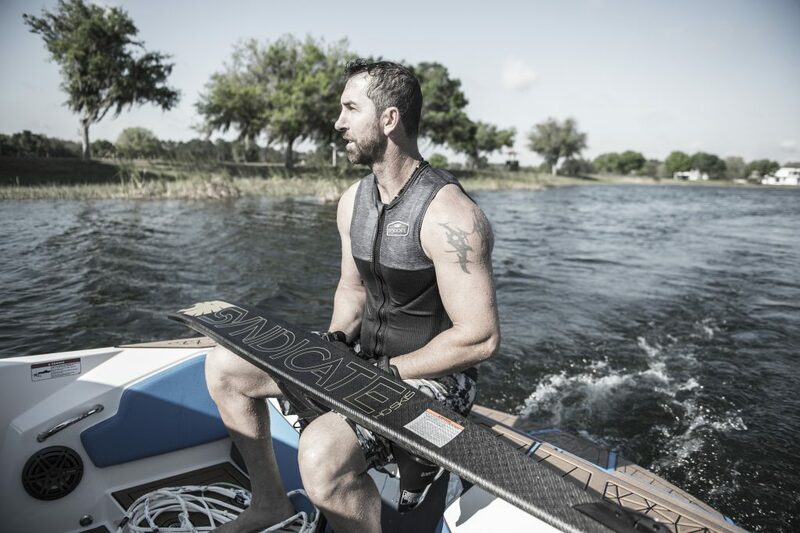 Learn how to Waterski with Ski Legend Wade Cox! 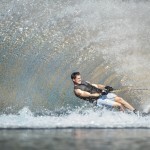 How to Waterski: Waterskiing made simple. Free DIY Waterski Instructional! 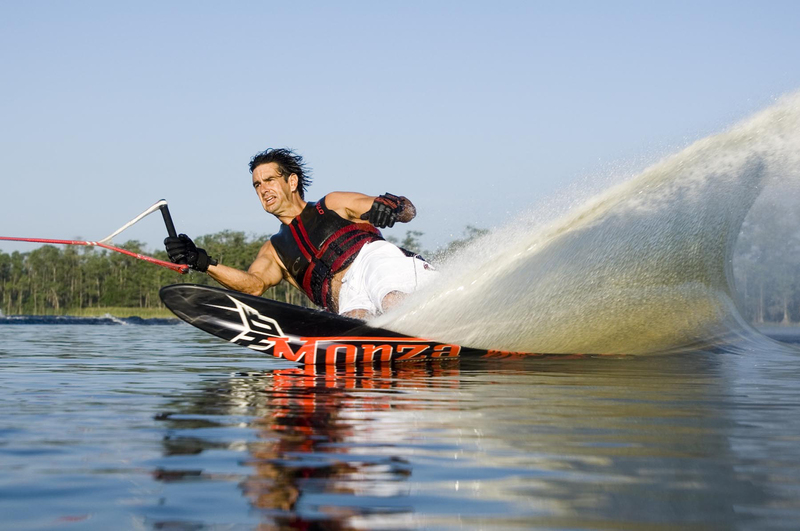 Waterskiing is a great sport for the whole family.In this video, waterski legend Wade Cox walks you through a simple instructional of how to get started skiing. Now everyone from small children to grampa can learn the fundamentals of waterskiing and waterski coaching. 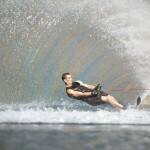 Check out www.hosports.com/learn2waterski for even more tips on how to make skiing fun, easy and safe. In 2013 we embarked on an incredible journey. The only goal was to revisit what got us hooked on waterskiing in the first place. With that in mind, we gathered a group of fun loving friends, (from waterskiing to CrossFit to film production), rented a house-boat and embarked on an adventure of a lifetime at Lake Powell in the southern Utah area. Here’s a throwback to the trip that started it all.